Editor's note: This is the second in a series of posts by Dennis Horne about collectible books. The introduction is here. Perhaps the rarest and most expensive of the personal autobiographies by a high Church leader, this book wasn’t even known to exist by most of the LDS collecting world until after 2000. 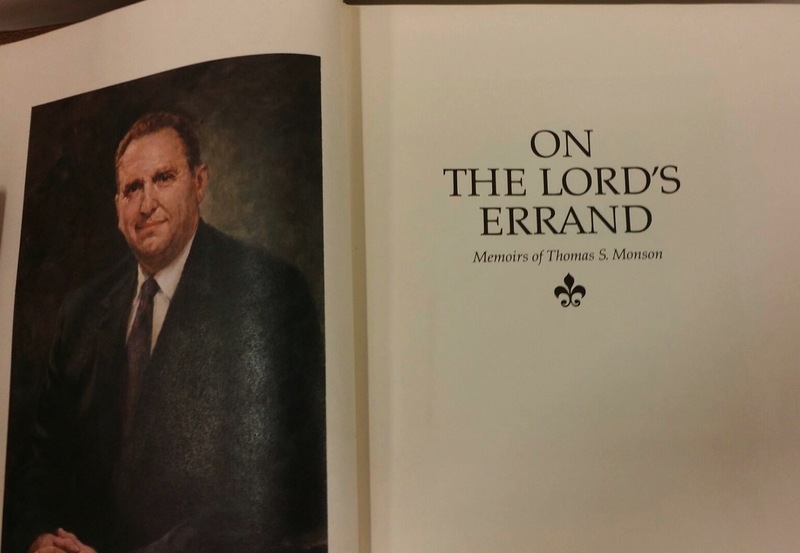 When it finally surfaced (after being privately published in 1985) it quickly created a demand for itself, especially when President Monson became the President of the Church. In 2009, when someone brought to President Monson’s attention the fact that a copy had just sold on the internet for $3,600, he joked that he “should have had more of them printed”, and observed that he had written it for family and close friends. As these friends age and then pass away, it is thought that a few more copies may eventually trickle their way into the rare LDS book market. However, it remains to be seen how this possibility— along with the issuance by Deseret Book of an official biography meant for public consumption—will affect its price and collector demand. An early version of the now well-known story of young Tom Monson giving his first blessing to a friend in military service, with favorable results (105-6). The story of Bishop Monson administering to someone, accidentally using insect repellant instead of consecrated oil in the ordinance (159; such a story would never make it through internal Church censors). His experiences working with church leaders publishing books (174-177, 329, 342). Counsel from President J. Reuben Clark to mission president Monson about how to answer gospel questions when you don’t know the answer (192). Numerous personal experiences related of heeding spiritual promptings to give service (see 298 for example). Numerous experiences blessing the sick (318-19, 347-48, 402-4). Mention of the 1978 revelation on the priesthood given to President Kimball (359-61). Because the book was issued in 1985, it lacks coverage of President Monson’s multitudinous experiences since (which are covered in his authorized biography), but is still one of the better personal autobiographies to be written by a senior Church leader, with the fact that he became the President of the Church greatly adding to its desirability. Also, to date, it is the only book written by President Monson to have any strictly “collectable” value, since all his other works were printed and sold in such abundance as to eliminate the high-priced used market. Great stuff, D! Keep it coming. I've missed this kind of collectible talk the past decade. Indeed. As I have thought about this particular book, which I once owned myself for a short time, it occurs to me that the demand, and therefore maybe the price, may drop when Pres. Monson passes away. I guess time will tell.